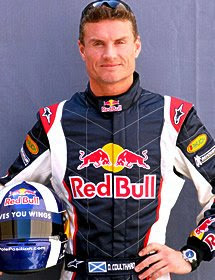 British Formula One racing driver from Scotland David Marshall Coulthard, as well known as DC, was born on March 27, 1971 in Twynholm, Kirkcudbrightshire. He has won thirteen grands prix, including two at Monaco, which made him the first British driver since Jackie Stewart to take victory there. He currently drives for Red Bull Racing. Red Bull Racing and Scuderia Toro Rosso are Formula One teams owned by Austrian beverage company Red Bull. The team is managed by Christian Horner, boss of the Arde n International GP2 Series team. The team is now competing with an Austrian licence having previously competed under the British flag.